Antonio Gaudi’s Sagrada Familia – the Basilica and Expiatory Church of the Holy Family – is the most visited tourist attraction in Barcelona with about 3,000,000 people per year purchasing admission to enter the church. Thus roughly half of all tourists in Barcelona visit the church. The easiest explanation for its popularity is the singular character of the church. Begun in 1882, and slated to be completed by 2026, which is the 100th anniversary of Gaudi’s death, the church looms large both in its physical presence and its cultural importance. Sagrada Familia’s unusual profiles, its external “skin” that is by turns encrusted and severe, and the eighteen spires, which when completed will include the tallest church spire in Europe (566 feet or 172.5 m.), all command attention – as does the story of Gaudi’s intense devotion and creative genius. In an earlier Artway article (Permanence and Change at Sagrada Familia) I described the origins of the church, and discussed distinctive aspects of the exterior structure. The interior of the church is not a stylistic continuation of the variety seen outside. Rather, it is cohesive visually and feels new – which in fact a great deal of it is – as the pace of construction picked up in the last part of the 20th century. The central Nave vaulting was completed in 2000 and now the construction of the central “Christ” tower and four Evangelist towers that sit above the crossing are being built. The feeling of newness in the interior is accentuated by the crisp, geometric language of its forms, with a variety and quality of structural stones that show little suggestion of being fashioned by hand. The interior light is a dramatic mix of natural light coming from small windows in the vaults, some artificial light, and light from stained glass in the walls that gradually becomes more chromatically intense as it comes closer to the ground level. The stained glass is largely devoid of the imagery associated with historic stained glass, and while it has some text, the glass seems to function more like music, washing the spaces with changing chords of color. In my judgement the interior is an architectural marvel, as well as an arresting symbolic space that is connected with the past even as it extends Christian imagery into new forms. The plan of Sagrada Familia is a typical Latin cross with five nave aisles and three transept aisles. Sometimes the church has been seen as an idiosyncratic continuation of a Spanish Gothic style, but Gaudi was critical of the Gothic, as he considered the style’s signature flying buttresses to be “crutches”, which marred a structure’s architectural integrity. The last decades of his life were devoted to developing ways to allow light through the church’s high walls and ceiling vaulting without such buttresses. At his death in 1926 his studio was full of drawings and models made to pursue more minimal and “natural” structural supports. Gaudi was a tireless draftsman, model maker, and experimenter – he worked through trial and error, and constantly refined his findings. The museum below the church has both models and things made for structural analysis. One object is a form festooned with weighted lengths of small cable. The cables hang down in the profile of catenary arches, and each arch shape is determined by the distance between the suspension points, the length of cable, and the amount of weight. These helped him determine the shape of arches he used, as the suspended weight revealed the loads that stone or reinforced concrete could support. Gaudi abandoned the common practice of using vertical columns before building Sagrada Familia, as can be seen in the unfinished Church of Colonia Guell. 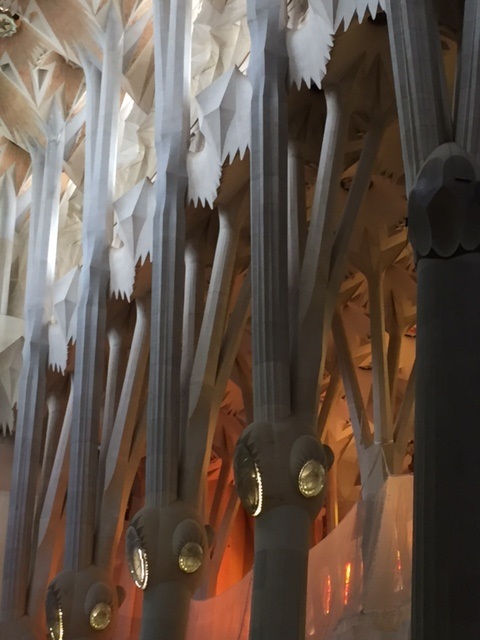 The columns in the nave of Sagrada Familia are not only inclined, but also branch, springing into two or four columns, and resemble the trunks of trees. 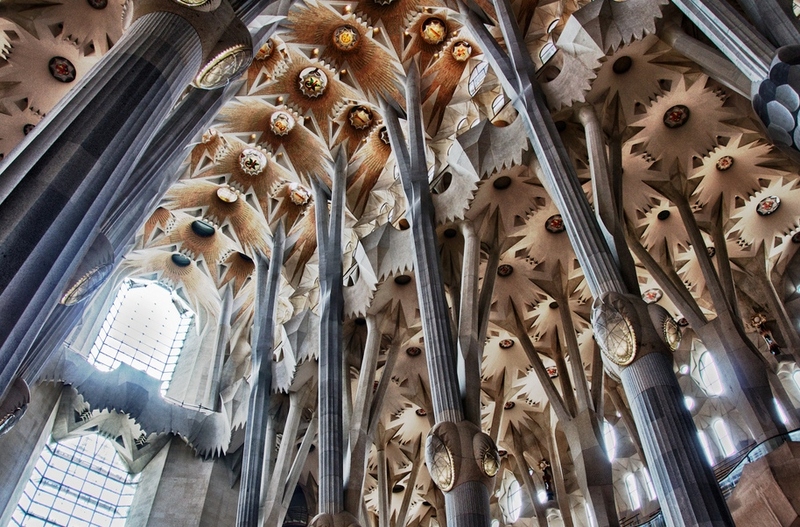 Gaudi’s assistants said that he conceived of the whole interior as a forest, where the nave ceiling would invoke the image of an arboreal canopy. Saw-toothed edged panels spring from those branches and make the transition to the vaulting intensify the reference to trees, as do the warped surface floret-shaped forms around lights and openings in the vaulting. Both natural light and interior lighting in the vaults evoke sunlight filtering through a forest. There is a unique mixture of abstract geometry and references to nature at the heart of the visitor’s visual and spatial experiences in the interior of the church. When Gaudi’s studio was attacked and burned by anarchists in 1936 during the Spanish Civil War, the vast majority of his drawings was destroyed and most of the plaster scale models were broken into pieces. A younger architect who had assisted Gaudi, Lluis Bonet i Gari, collected the pieces and hid them until the war was over. After the war the laborious task of re-assembling the models began, with new plaster filling the sections that were missing. The few surviving drawings – or photographs of drawings – were intensely scrutinized. But the loss of so much material has supported the argument that Gaudi’s intentions could not be known, and that construction since the loss of those records is essentially invented and not “true” to Gaudi’s vision. There have been several petitions to stop construction, but all to no avail, since the work is funded by donations and entrance fees, and the project is a private entity, without external political or local ecclesiastical oversight. The best argument for the continuation of construction is rooted in two facts. The first is that there were still people who knew and had worked closely with Gaudi on Sagrada Familia when construction picked up again after WWII. The onsite presence of those who worked with Gaudi extended into the 1980’s. These “disciples” were committed to Gaudi’s work, and trained younger artisans and architects, which created a community of collective memory. 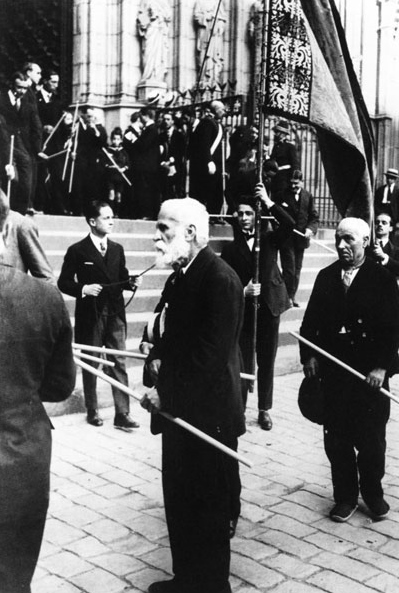 But more importantly, Gaudi said that he expected and welcomed the participation and insights of the architects who would follow him. His student Cesar Martinell recalled Gaudi telling him: “I know that the personal taste of the architects succeeding me will have an influence on the work, but I don’t mind: I think it will even be to the benefit of the temple.” As if to underscore this recollection, the long study of Gaudi’s geometric forms has shown that they are flexible in terms of scale, orientation, and shape and can join with related forms to create different configurations. This seems to suggest Gaudi was concerned with leaving succeeding generations a vocabulary, but not a rigid plan. The search to understand the order within Gaudi’s complex forms has been the subject of intense study as the church construction progressed. At first progress was painfully slow as architects and builders sought to unlock the system hidden within the plaster casts through reconstruction and analytical drawings. The pace quickened with the advent of computer assisted design. Mark Burry, an architect from New Zealand, has been involved with the building of Sagrada Familia since 1979 and initiated the use of computers. Burry is currently the Professor in Urban Futures of the Melbourne School of Design at the University of Melbourne, Australia, but he commutes from Australia to Barcelona every two months to work on the church, where he is the Senior Architect and Researcher. 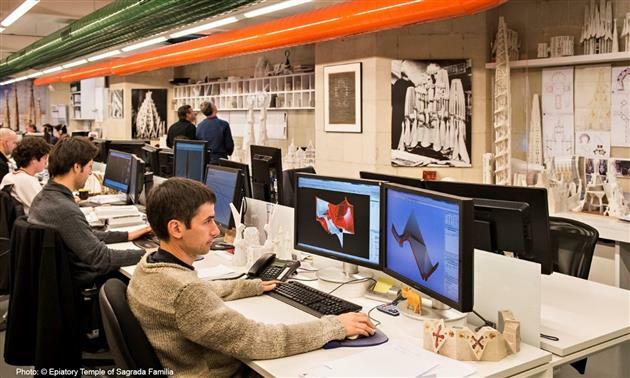 It turned out that CAD, the design program commonly used by architects, is not capable of analyzing Gaudi’s forms. So Burry turned to aeronautical software and adapted it to make the analysis of these complex surfaces. His program revealed many things, including that Gaudi did not use a design system based on units of ten, but rather - like the ancient Egyptians, Chaldeans and some medieval builders – had a system based in units of twelve. Gaudi’s third and last design for the interior is the result of his use of “ruled surface” geometry, which allows for the stunning permutations of columns, folds, saddles, cones, ridges, and warped planes that we see inside. The computer has also assisted in construction, and much of the recent stone work seen in the interior has been fashioned with CNC machines and robotics. Surely this contributes to one’s sense of unusual uniformity, cleanliness, and an apparent lack of a human touch in the sanctuary. Similarly, the plaster models made today to study the architect’s proposed designs are now 3D printed. 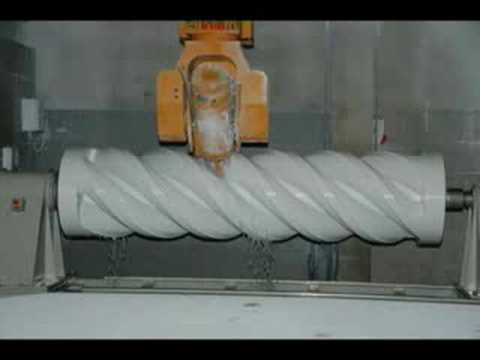 The announced goal of completion by 2026 would be fanciful were it not for the speed with which both decision making and fabrication have increased due to the computer’s use in the last twenty to thirty years. It is beyond the scope of any article this length to cover even the major aspects of Sagrada Familia. There are two excellent resources for those who can’t visit the church itself. One is the 2015 book Sagrada Familia: Gaudi’s Unfinished Masterpiece, Geometry, Construction, and Site. It is copiously illustrated with spectacular photographs. The other is a 52-minute film from 2010, Liquid Stone: Unlocking Gaudi's Secrets, which can be streamed through the services of some libraries. Both involve historical material, but are largely concerned with the present, and have interviews with or essays by the people responsible for bringing Gaudi’s vision to completion. In conclusion, it is interesting to note that some of the critics of continuing construction have changed their minds. One of the people who organized a large international protest by architects and designers in the 1960’s was the architect Oscar Tusquets Blanca. He was a student then, but maintained his opposition to the project through the early 2000’s. Now he has changed his mind. In a 2011 article he related how an architect friend persuaded him to tour the church together. He wrote “How could we have been so wrong? This wonder would not exist if people had listened to us 50 years ago.… I don’t know whether it is the finest work of the last century, but it will certainly be the greatest religious building of the last three.” That is high praise indeed - and deservedly so.